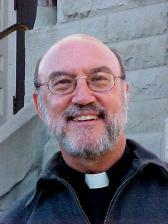 I am a Jesuit priest, born in Milwaukee in 1937. The oldest of six children, entering the Jesuits in 1955 and teaching in the theology department at Creighton since 1972. My primary interest is in contemporary Christian spirituality. I've written three spirituality books -- which I hope you'll buy: In His Spirit: A Guide to Contemporary Spirituality; Moving in the Spirit: Becoming a Contemplative in Action, both published by Paulist Press and Finding God in Troubled Times: The Holy Spirit and Suffering, published by Loyola Press. I'd like my epitaph to read: "He helped us recognize God's presence in our lives." I hope my reflections help you -- and me -- be more conscious of God's presence in our life today.